The River Teviot alongside Mansfield Road in Hawick. Plans for Hawick’s proposed £41m flood protection scheme are now open to scrutiny by townsfolk. A vital requirement for the scheme to go ahead is that all the relevant documentation and drawings associated with it are made available for public inspection. 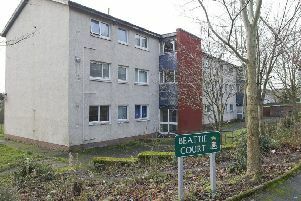 Hawick's Scottish Borders Council contact centre. Now those documents and drawings are ready to view, with hard copies provided at Scottish Borders Council’s Hawick contact centre, in High Street, from 9am to 5pm on Mondays, Tuesdays and Thursdays, 9.30am to 5pm on Wednesdays and from 9am to 3.45pm on Fridays. The documents can also be viewed at council headquarters at Newtown from 8.45am to 5pm Monday to Thursday and 8.45am to 3.45pm on Fridays. After examining the plans, members of the public can express their views to the council. A report accompanying the document states that Hawick “presents a challenging location for effecting flood risk management”. It adds: “The proximity of existing infrastructure restricts space for construction, and its conditions constrains which methods can be employed safely. “The mixture of residential, commercial and industrial neighbourhoods require differing approaches which are appropriate to each setting. “While the primary social impact of the scheme is positive – reducing flood risk – mitigation of adverse impacts were also addressed. “Views of the river are maintained, where possible, by minimising wall height. “Where this is not possible, viewing windows are proposed for key vantage points. The document outlines the areas where money is to be spent on having works carried out, including £10.4m on 1,997m of flood defence wall along Mansfield Road, past Scottish Water, Hawick Rugby Club, Albert Park, the recycling centre and the council depot. In addition, an estimated £6.3m will go on 922m of flood defence wall adjacent to Volunteer Park, Buccleuch Park, Hawick High School, the town’s Royal Mail sorting office and Orrock Hall. Further areas of work include a stretch along Duke Street and Glebe Mill Street and the embankment and wall around Weensland Mill. Alternatively, correspondence can be sent in writing and posted to: Chief Legal Officer, Scottish Borders Council, Council Headquarters, Newtown St Boswells, Melrose, TD6 OSA.